Carbon dioxide is a most effective clean agent. It can be used to protect a wider range of risks than any other clean agent and at lower cost! The first use for fire protection was in 1902, when a fire chief was faced with a mountain of coal dust, burning in the centre. The Lux factory nearby was producing large volumes of CO2 as a by-product. The fire chief organised the piping of CO2 to the deep-seated fire, which all other means had failed to extinguish, and within a few hours it was under control. The value of CO2 as a fire extinguishant was recognised in the USA, the concept developed, and the first six page standard for the systems was published by the NFPA in 1928. Before halon was even conceived, carbon dioxide systems had already extinguished thousands of fires. Given the development of new gaseous halon alternatives, such as FM 200 and Inert Gas, and fine water spray systems, which are each, excellent in their own right, why are carbon dioxide systems finding increasing use in both land based and marine applications? Carbon dioxide extinguishes fire mainly by displacing oxygen in the flame zone with an inert atmosphere. There are also degrees of physical and chemical action. It is therefore a little more efficient than the inert gases, requiring lower concentrations for a given application. At the other end of the spectrum of uses, since it is in a liquid state until it reaches the nozzle, it has a reasonable ‘throw’ and thus can be readily used to smother fires on the surface of flammable liquids in local application mode. Carbon dioxide naturally exists in small quantities in the lower atmosphere. It is a by-product of many industrial processes, available worldwide at low cost to a consistent specification for many uses, such as in the soft drinks industry. Although carbon dioxide is known as a ‘green house’ gas, its use in fire protection is environmentally neutral. 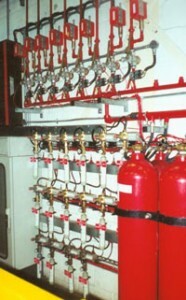 Carbon dioxide for fire protection systems is either drawn from atmosphere, or is taken as a waste by-product from other processes. Since it is stored in cylinders until a fire occurs, only a small proportion ever reaches the atmosphere. Carbon dioxide does not contribute to ozone breakdown. Table 1 shows the relative environmental impact of carbon dioxide in comparison with halon and other gases, and potential agent breakdown in fire. snuffing out of vent tip fires in petrochemical risks. Carbon dioxide offers an unequalled capability in the control of ‘deep-seated’ fires. Whether or not a system needs to be designed to meet the challenge of a deep-seated fire depends upon skilled risk assessment. Most fires in electrical/electronic equipment, ducts and voids can be treated as surface fires if an appropriate fire detection system is employed. Fires in paper stores, archives and bundled cable runs are more likely to become deep seated, and require greater concentrations and longer hold times, which are given with other requirements in the Standards. For all gaseous fire extinguishing systems, it is now normally required that the room or enclosure be evacuated before the gas is discharged. Usually systems are on automatic control, and discharge takes place after a time delay sufficient to allow evacuation. With carbon dioxide much stricter controls are necessary. If it is physically possible for persons to be in the protected area a any time, then a ‘lock-off’ system must be installed to ensure that there can be no discharge whilst the area is occupied. In recent years, very secure and reliable ‘lock off’ procedures and equipment have been developed, which we incorporates in system design to ensure safety. For total flooding applications, the basic design concentration is 34% by volume, except where fires might become deep seated, in which case concentrations of up to 75% can be required, with hold times of 20 minutes or more. The extinction of fires in ships’ cargo holds often requires far longer hold times. Where flammable liquids may be involved, higher concentrations may be needed, as indicated in the Standards. Quality and reliability of installed systems. As has already been indicated, although carbon dioxide itself is one of the simplest extinguishants available, system design requirements can vary greatly. The design of safety equipment and procedures is critical, and the absolute reliability of systems and interfaces is vital for effective system operation in the event of fire. Accordingly, the use of very well proven equipment such as valves, nozzles, detection and electronic controls is imperative. Even the best equipment can fail to operate satisfactorily if it is not installed correctly, and companies such as Universal Fire put a great deal of effort in ensuring correct installation. More than 70 years of use in fire protection systems, plus the very wide range of risks that carbon dioxide systems can protect, establishes the platform for the optimum application of carbon dioxide today. Despite the good track record of performance in a multiplicity of applications, there is still a need to ensure that systems are designed, installed and maintained by skilled experts, from approved companies with long standing expertise in this field of fire protection.